No, it wasn’t the first. But by God it was the biggest up to that point. There were undoubtedly more “long fragile banners of victory” hung at Toomer’s during the celebration of 17-16 than any that came before it; there were undoubtedly more people there with undoubtedly more to celebrate and who might have celebrated harder than any kindred celebrants before or since. 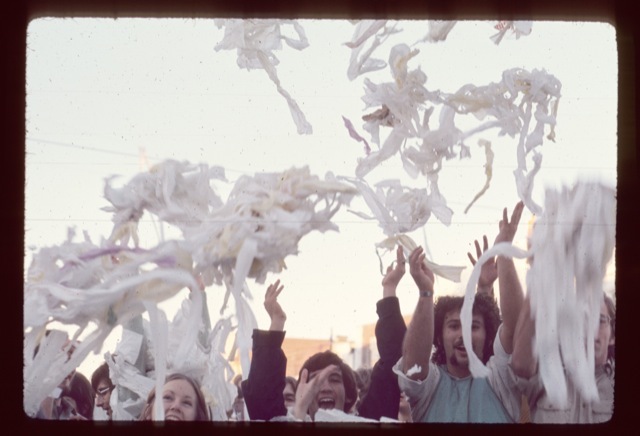 So its certainly possible, and certainly reasonable to think that the sheer volume of the toilet paper and the sheer size of the crowd that day might’ve played some sort of special role in establishing the spectacle not just as a tradition but as a gameday must. What we know for sure is that it brought out the cameras. 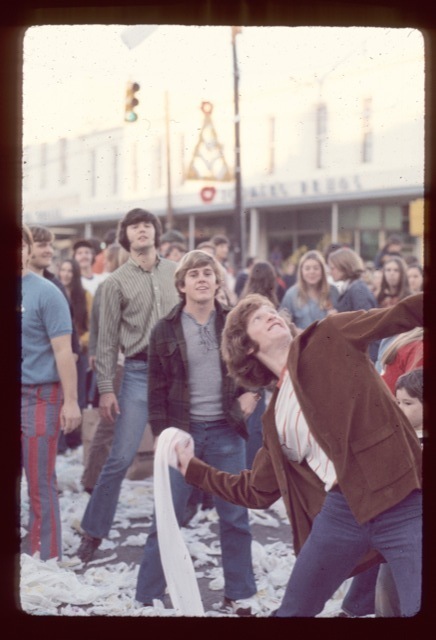 And, hallelujah, the one belonging to Cecil Bridges (’74) had some Kodachrome in it. And if there’s anything that can give you a feel of what rolling wires and lines and anything but trees come 2013 or whenever it is might be like, it’s these never before seen COLOR photos—the first we’ve ever seen, the only we know of—of real people* living just like we live: blue blue jeans, green green lights, blonde blondes, brunette brunettes, orange spray paint, taste the rainbow, kiss the dragon. * And—sixth photo down—hipsters! Who knew the Quadrajets / Immortal Lee County Killers’ Chet Weise was a time traveler! It takes more than 200 hours each month to produce, edit, and maintain The War Eagle Reader. If you like what we do, and you’d like to help us keep doing it, please consider making a small donation, or advertising with us. Thanks! 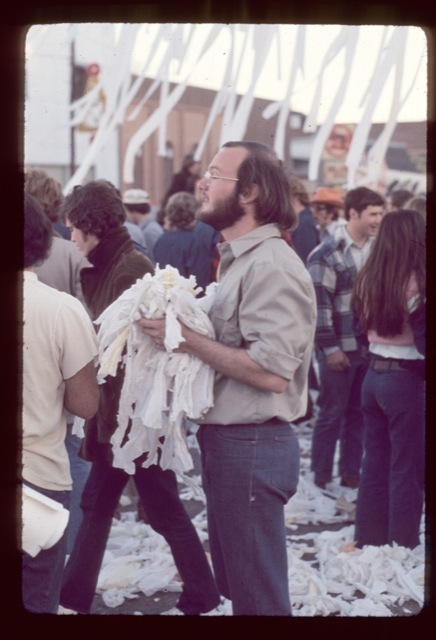 BUCK FAMA: Black and white photos of Toomer’s being rolled after Punt, Bama, Punt. 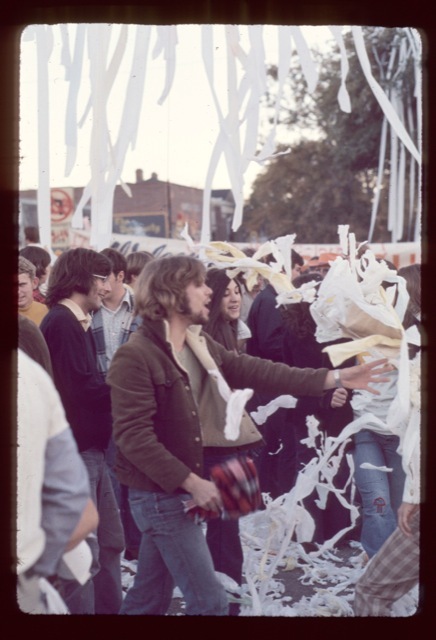 More on the the Toomer’s oaks: Here’s what the type of tree that might replace Toomer’s Corner looks like / Wire system being considered as temporary solution for rolling Toomer’s / On the feasibility of a Toomer’s Corner transplant / Toomer’s Corner rollings didn’t start with Punt, Bama, Punt, says History / Did Auburn students celebrate Bear Bryant’s death by rolling Toomer’s Corner? Damnit, why won’t the bank show the temperature? We know the time, how warm was it? Well, War Eagle Atlanta, since we beat Bama the way we did, obviously hell had frozen over…so it must have been warm and balmy in Auburn. I’m loving the people on the roof of the bank. 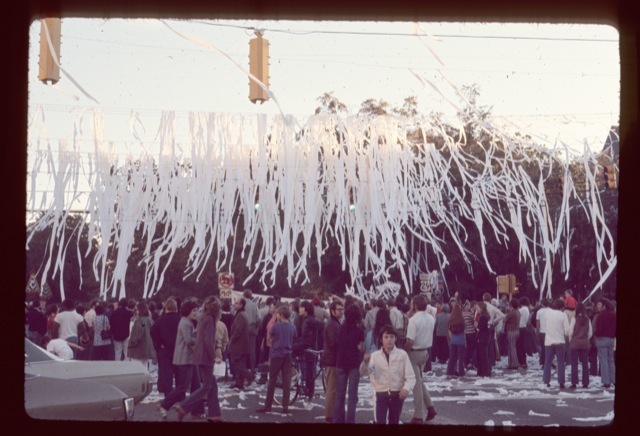 Great view of Toomer’s!!! 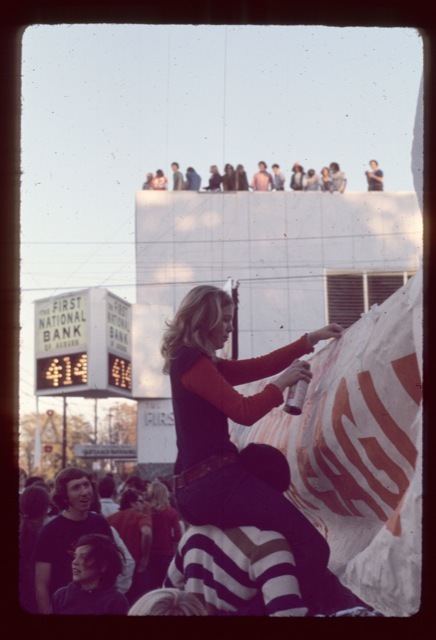 You know, it wouldn’t be a vintage War Eagle Reader Photo Collection if it didn’t have some girl’s badonkadonk. Well done, Jeremy. Maybe I’m a product of my generation, but rolling the wires just doesn’t seem the same … War Last 20 Years. Ann, Skinny jeans were around way before the tight jeans of the ’80’s. They had to be customized to fit and were called ‘pegged jeans’ in the 50’s. You had to have help to get them off. We wuz ‘cool’!! omg, I was there! I was hoarse from screaming at the game. these are great photos. 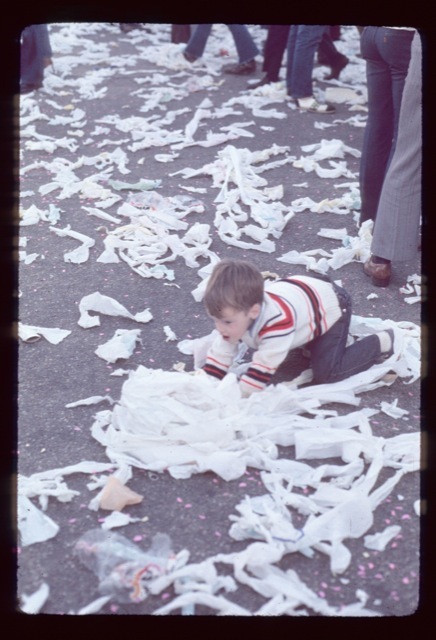 Believe it or not, that was the first Iron Bowl I ever went too. Amazing. The kid in the last two pictures is me. Will, I was about to say the same thing. 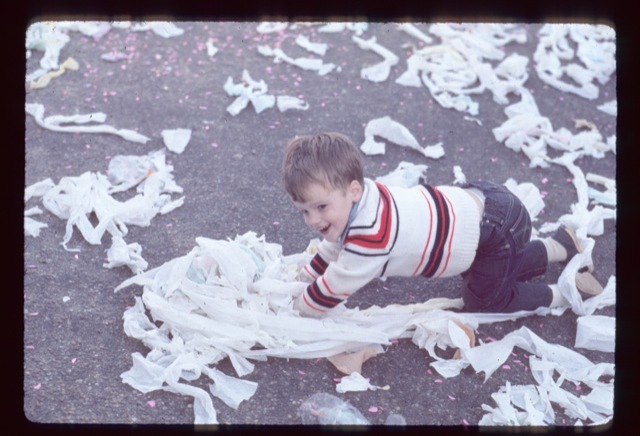 I was about that age in 1972, too. 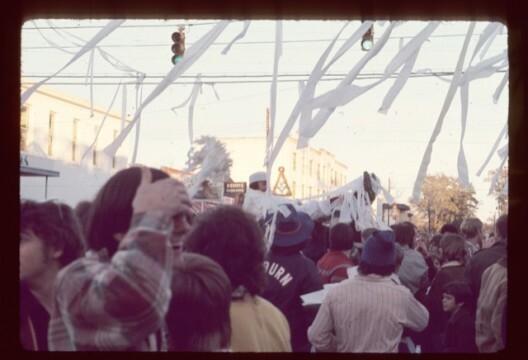 But I’m pretty sure I wasn’t in Auburn (or B’ham) that day. Probably home in Sylacauga.